Finally some good news! Α first instance court prosecutor this week slapped embezzlement charges on high-profile entrepreneur Lavrentis Lavrentiadis in connection with a 54 million euro loan personally approved for him by Proton Bank. in the period when he was serving as president. Press reports in Athens say that the investigation centers on large loans estimated at roughly 700 million euros, which were said to be damaging for the bank and which were given out in loans to companies and/or individuals that were said to be related or associated with Lavrentiadis. The entrepreneur now has until January 30 to prepare his testimony. 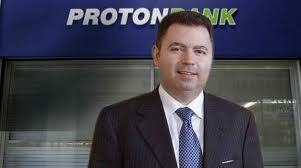 An audit by the Bank of Greece, which regulates the industry, found that more than 40 percent of Proton's commercial loans in 2010 were made to companies related to Lavrentiadis. The report says this was part of a "misuse of the basic principles of lending and assurance." A separate investigation, signed by a senior prosecutor who heads Greece's money laundering authority also discovered that Lavrentiadis (once hailed as the rising star of Greek business and known as a leading patron of the arts) had "formed a criminal team" with other "shady individuals" that apparently embezzled more than 50 million euros from the bank. It alleged loans made to dormant companies had been wired from Proton to another bank, the Piraeus Bank and then withdrawn by an employee in bags of cash.